If you’ve just been in a car accident, the first thing you’re thinking about probably isn’t your insurance. But it should be in the forefront of your mind. From expensive medical bills to time off work to vehicle repairs, a car accident can cost a small fortune. And if the at-fault driver was uninsured or underinsured, you’ll have to investigate every possible option for recovering compensation. If you have uninsured motorist coverage, your insurer should cover your medical bills, lost wages, and possibly other damages up to your policy limits. You may also be able to recover compensation from your Personal Injury Protection (PIP) coverage, medpay, and/or collision coverage. After an accident with an uninsured driver, contact your insurance company as soon as possible and ask about the types of coverage on your policy. Some of your medical expenses may be covered by your health insurance. Review your policy and call your provider to learn about your options. You can file a lawsuit against the parties who were liable for your collision. Unfortunately, drivers who do not carry auto insurance typically do not have the funds to pay for the damages they cause in accidents. The steps you take after a crash with an uninsured motorist are essentially the same as those you would take after any other accident. The most important step after any accident is to seek medical attention for yourself and anyone else who was injured. Call the police, and request emergency medical assistance if necessary. When an officer arrives, make sure he or she creates an accident report. Take pictures of injuries, property damage, the intersection (if applicable), and skid marks. You should also take photos of the other driver’s plates and registration. Your next step is to undergo a medical evaluation. Even if you feel fine, it’s a good idea to visit your doctor in case you eventually decide to file a claim. It will be much more difficult to recover fair compensation if you do not have medical documentation to prove the extent of your injuries and to tie them to your collision. It may also be a good idea to consult a personal injury attorney. An accident lawyer will evaluate your crash (usually in a free consultation), review your insurance policies, and explain your options for recovering compensation. An injury attorney can also calculate your damages so you recover the maximum payout possible, and handle negotiations with the insurance adjuster. Finally, a lawyer can help you avoid costly mistakes that would harm your claim such as accepting a settlement too early or posting sensitive information about your case on social media. 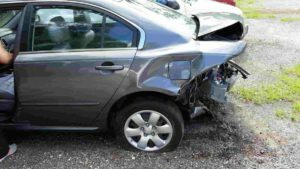 What Damages Might Be Recoverable after a Car Accident? The answer to this question depends on multiple factors including the state where the collision occurred and the types of damages you sustained. In most states, accident victims can pursue economic, non-economic, and punitive damages. Economic damages are objectively verifiable. They include medical bills, lost wages, and vehicle repairs. Non-economic damages are more subjective. Examples include pain and suffering and emotional distress. Punitive damages are only available in cases when the defendant acted egregiously. They are intended to punish the defendant in order to prevent similar behaviors in the future. Were there any important points we missed? Feel free to leave a comment below.